The original Knockout continues to deliver knockout good looks and top performance. 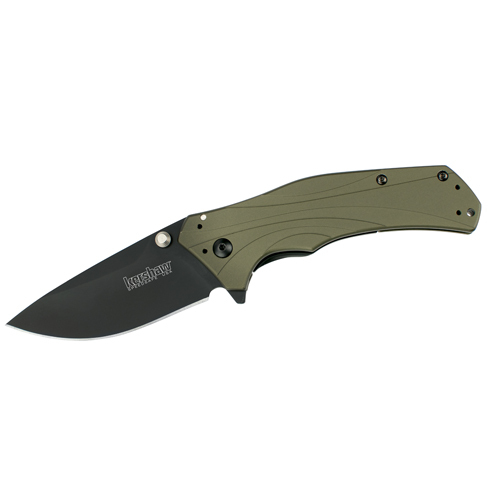 But now Kershaw has kicked it up a notch with an olive-green handle and black DLC-coated blade. The olive-and-black Knockout still has its namesake knocked out section in the handle. This knocked-out piece in the anodized aluminum frame is replaced with a stainless-steel plate to form the sub-frame lock. This steel plate moves behind the knife blade to lock it open safely and securely. Yet because only part of the knife handle or frame is steel, the Knockout can maintain a lighter fighting weight and still provide a strong lock. The result is a knife that's big, yet lightweight enough to carry every day. The blade is a modified drop point in high-performance Sandvik 14C28N stainless steel with matte black DLC coating. The steel offers excellent corrosion resistance and harden ability, while the coating protects the blade and enhances performance. The Knockout is equipped with SpeedSafe assisted opening for smooth and easy one-handed opening. Just pull back on the built-in flipper or push on the thumbstud and the blade moves out of the handle quickly and easily. Kershaw's olive-and-black Knockout also comes with Kershaw's deep-carry pocket clip so the knife can sit all the way down in the pocket. Even better, the handle is drilled for 4-position carry. Lightweight and versatile, this Knockout provides a color combination that will make it an ongoing favorite.